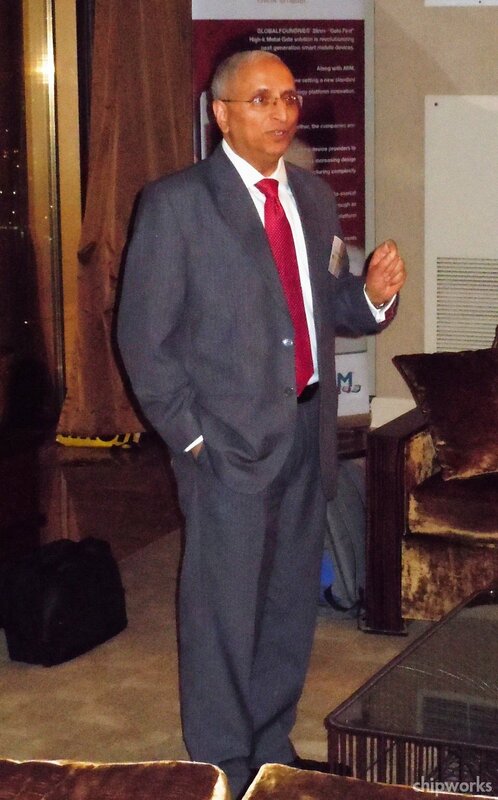 GLOBALFOUNDRIES has hosted a reception for the last three years at CES, although they don’t exhibit there, or even take a suite for the show – they find it a useful way to connect with customers and the analyst and journalist community. Held on CES Tuesday (Jan 10), I expected a large Intel-style gathering with lots of flash, but it was actually quite low-key in a hospitality suite at the Mandalay Bay resort, with no more than thirty people there at any one time. 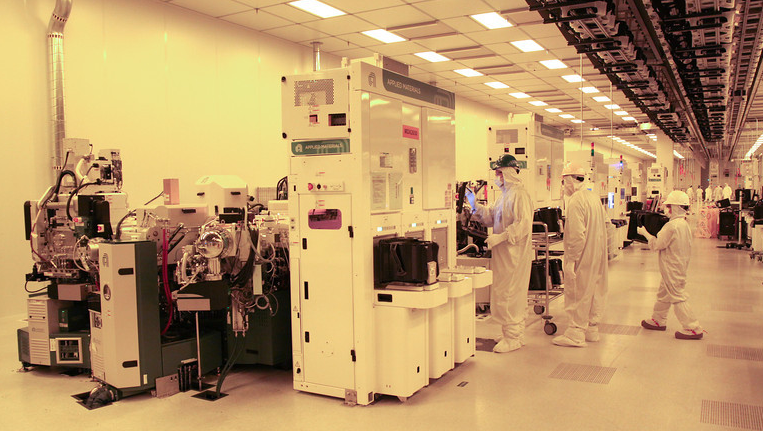 After the initial introductions, Ajit stood up and gave a short speech celebrating the first silicon coming out of Fab 8 in Malta, New York, as announced that morning – the first wafers squeaked into 2011 as promised, coming out of the line on 27th December; and we can expect the first 20-nm silicon in June. He also spoke of the recent management changes and plans for $3 Bn capex for 2012 revealed in an interview the same day, bringing the total capex for the last three years to almost $12 Bn, showing their commitment to stay the course in the industry. He emphasised that "GLOBALFOUNDRIES is not just Dresden", and that the former Chartered Semi fabs in Singapore were contributing significantly to GloFo’s bottom line. The roster of customers that were present supported that, since most were fabless companies with product using larger node processes than the 45- and 28-nm product from Dresden. Notably, AMD were not present, at least when I was there. A good crew of GF management was there, Kevin Kimball (VP, Global Communications), Mojy Chian (Senior VP, Design Enablement), and his colleague Derek Meyer, and Subramani (Subi) Kingeri, (VP of Design Solutions – 14nm), amongst others. 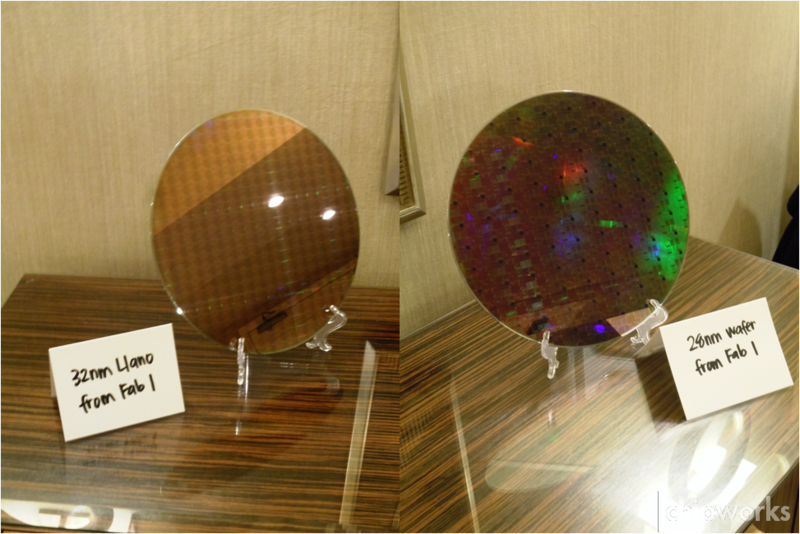 There were a couple of wafers on show too, unfortunately not from Fab 8 – that would have been really topical! GloFo is clearly staffing up at Fab 8 – they held a job fair there last week and reportedly have hired 1100 so far, heading for 1400 by year end. By the look of some of their stock photos, they are still not 100% functional yet, but it obviously won’t be long! GloFo shot of Fab 8 clean room – note the hard hats and hand-carried FOUPs! If you’re one of the Twitterati, follow my occasional tweets at @chipworksdick. The Intel press session Monday morning at CES was focused exclusively on the Ultrabook, with Mooly Eden hyping up this supposedly new category of laptop. He prefaced the talk by saying there would be no discussion of 22 nm, Ivybridge, or any new silicon; the emphasis would be on "experiences" achieved by Ultrabook, not just speed and performance as Intel has done in most of the last few years. Having said that, he went through an impressive array of the different applications that we use these toys for – games, internet, raw computing (as in graphics manipulation), and demonstrated the added security that they’ve built in since incorporating McAfee last year. We then had a series of different versions of Ultrabooks, some of which were like the old HP systems where the screen could be flipped to turn it into a tablet (only these days with touchscreen). One of the most interesting had a small additional touchscreen on the lid, about 2" wide and the length of the laptop, so that it could be accessed without opening up and powering up the whole thing. A concept at the moment (Nikiski, I think it was called), but to me it had potential. Of course, now that we are in the days of Apple’s Siri, speech recognition has to be on the horizon, so Mooly announced a partnership with Nuance and their Dragon system, and brought out their CEO for a few minutes of mutual congratulation. Gesture recognition is also the coming thing, so we had a demo of that,which evolved into a plug for the sheer computing power of the Sandybridge/Ivybridge parts and what they can do. Apparently there are more than 75 Ultrabooks coming onto the market this year, with screen sizes from 11 – 15", and at "affordable" prices. Then the VP of Marketing and Sales came onto the stage, and announced a change in marketing approach from speed and performance to experiences, as Mooly had said earlier. They will be doing a huge marketing campaign partnering with a whole lot of companies, more than just those branding the Ultrabooks. This will start in April – described as "epic’, and "cinematic". There was a mystical announcement made that Paul Otellini will have some significant statement to make at Tuesday’s keynote, and then we got to the "piece de resistance" of the show. Intel are "seeding" Ultrabooks to the media, and fifty lucky folks found white envelopes under their chairs, containing an Ultrabook – theirs to keep provided they play with them and write about the experience. Needless to say, the room went crazy, and I wasn’t one of the lucky ones! The rest of us do have a chance; apparently if we email ultrabookseeding@ogilvy.com with a good story on how we can promote Ultrabooks, they have some more to hand out. We’ll see! So to sum up, Ultrabooks are going to happen bigtime this year according to Intel, and not entirely to my surprise, there was no talk of a launch of any 22-nm product. I did ask one of the guys there if there was a launch date, but all he said was that there would a phased launch in the spring, based on application – I think we’ll see mobile product coming out first. Stay tuned for that one, as soon as we get analysis started we’ll let you know! At Tuesday’s CES keynote, Intel CEO Paul Otellini announced that there will be an Intel processor in a Lenovo phone, coming soon, and a new partnership with Motorola that will bring more Intel presence in the mobile arena. After some initial preambles about the ubiquity of personal computing, and confirming that the 22-nm Ivybridge is now shipping (with a line-of-sight to 14 nm), we got to the first of the "mystical announcements", and he invited Liu Jun on to the stage. Liu is a Senior VP of Lenovo, and President of the Mobile Internet and Digital Home Group, and he came up to announce the launch of the Lenovo K800 smartphone, to be shipped in Q2 to China Unicom. It’s using a version of the Atom processor, has a 4.5", 720p screen, runs Android, and has 8 hours of talk time and 14 days standby time. Not too many other specs were discussed, so we’ll have to wait until the phone surfaces in China for a more detailed look. 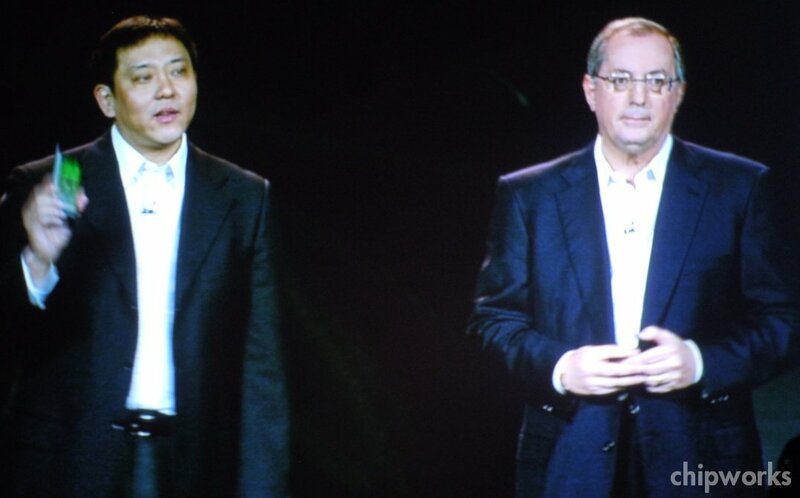 Liu also briefly brought up a 10" tablet using a 32-nm Atom processor, but no extensive demo there. There was an extensive demo of an Intel reference phone, which was impressive, but then one would expect it to be in a keynote talk. 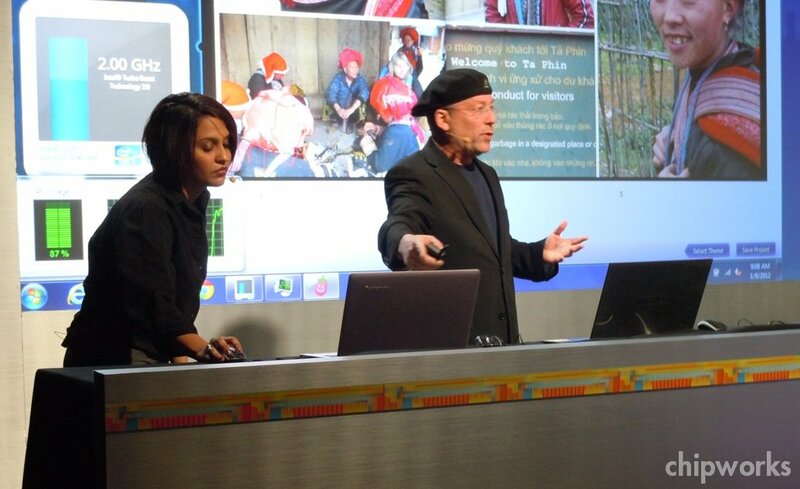 Later on there was also a brief showing of a reference tablet running Windows 8. Next up was Sanjay Jha, Chairman/CEO of Motorola Mobility, and they announced a multi-year partnership focused on making Intel-based devices, with the first phones coming out in the second half of the year. Now we get a sequence of visitors to the stage; first Chris Aubrey of Adidas, selling running shoes using an Intel-based video wall ( a big push for the Olympics in London), and then Jeff Clarke of Dell, launching their XPS13 Ultrabook. This looks very sleek, and can be ordered now, available in February, which presumably means it’s based on 32-nm Sandybridge, not 22-nm Ivybridge. After some showing off of the laptop/tablet convertible that Mooly Eden had on Monday, a couple of Intel staffers traded apps on a pair of Ivybridge-based Ultrabooks, which at least proves that they are out there and I presume at least some OEMs are getting silicon. The final visitor is Will.I.Am, talking about making music on an Ultrabook, writing a new song for every city while he’s on a world tour to raise money for inner cities (at least I think that’s what he said – he didn’t exactly look comfortable on stage taking techie questions). 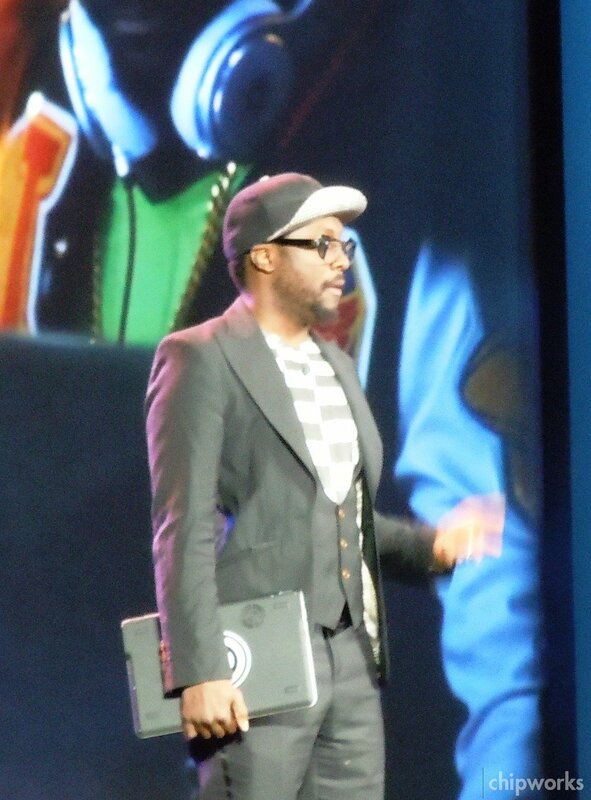 He finishes by holding the Ultrabook on his shoulder and announcing "the Ultrabook is the new blaster!" Then a post-amble about the spread of transistors and computers and we’re done – off the stage, no questions asked. Summing up – Intel is getting into the mobile space (probably slower than they’d like), Ivybridge is coming, and watch out for Ultrabooks. This year, for the first time I made it to the International Consumer Electronics Show (CES) in Las Vegas. To say it is an endurance test is putting it mildly – close to 150,000 attendees predicted and ~5,000 media/analysts, so we (there’s two of us from Chipworks) spend more time standing in line than actually seeing the show. 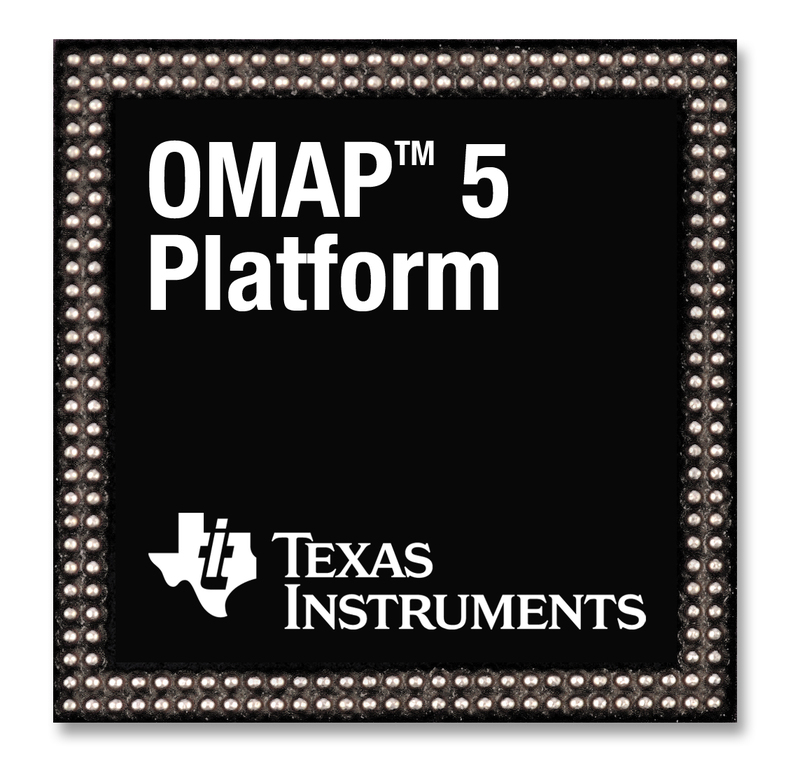 Be that as it may, Tuesday morning we went to one of TI’s suites at the show, and lo and behold, a working OMAP5430! Announced last year, this is something we’ve been anticipating at Chipworks for a while. The silicon came out of the fab two or three weeks ago and is going through phase one testing, but so far it’s "live, stable and 100% functional". Testing has gone well enough that samples are already in customer hands. There was a mobile demonstration unit showing graphics processing at 64 fps (using Android’s Ice Cream Sandwich), which compares with 47 fps for the OMAP4470. Other exercising is obviously being performed, but the space was pretty crowded so we didn’t get a chance to get an exhaustive display. There was a palpable feeling of achievement in the room, and the folks showing us around were like new parents – great to feel that buzz! Given that Huawei just announced a phone with the OMAP4460 in it, things are going well for TI. It’s too early to have a great deal of detail (so no pictures! ), but essentially the part is meeting the published specs, and on track to be a 2GHz processor. Fabbed in UMC’s 28LP process, it utilizes two ARM Cortex A15 cores, and two low-power Cortex-M4 processors (taking the "big-little" approach discussed at the ARM Techcon last year). It has 2 MB cache, and the graphics side is covered by dual POWERVRâ? ?¢ SGX544-MPx graphics accelerators. Initially it will be shipped in a 14 mm x 14 mm PoP with 980 balls on 0.4mm pitch, and the stock photo below looks remarkably like the Amkor Thru-Mold Via technology that we first saw with the OMAP4430 in the RIM Playbook. Given that first silicon is only just out, it’s unlikely that we’ll see the 5430 in a downstream phone or tablet for a year or so, but who knows, if things pan out well, some OEM may want to accelerate that and we’ll get it earlier. I hope so! Thanks to Brian Carlson, Mike Blaskovich, and Heather Ailara for hosting us and letting us be among the first to see this hot new device. We have been posting blogs from CES, mostly commentaries on the press sessions so far, at our Chipworks blog, and follow my occasional tweets at @chipworksdick. You are currently browsing the Chipworks blog archives for January, 2012.